New car brand set for the UK? A new car brand could be selling cars in the UK by the end of next year. Qoros is an independent Chinese manufacturer that will unveil a series of cars at the Geneva Motor Show next March. It then plans to start selling cars in both China and Europe by the end of 2013. According to the marketing spiel, the brand is aimed at 'discerning young buyers' it promises a 'strong committment to product and service quality.' It's first car will be a four door saloon which will be followed by a small and large SUV. No pictures are available yet but there is a sketch pictured above which shows what the front end will look like. The saloon has been designed to appeal to 'modern European tastes' and is similar in size to a Volkswagen Jetta. 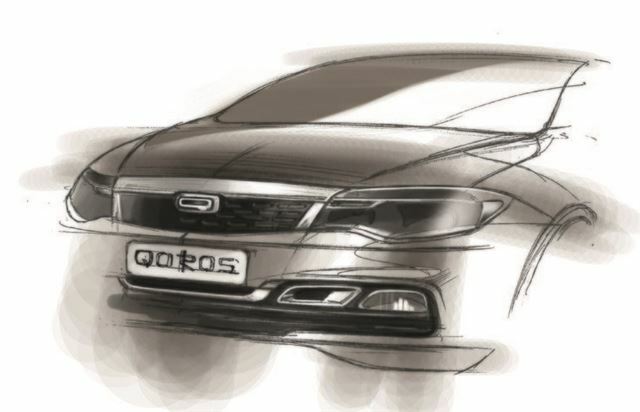 There are no details on engines but Qoros is promising both hybrid and electric versions. New variants are expected to be launched every six months. Crash safety has long been a concern over Chinese brands with the now infamous Brilliance BS6 crash test so it's no surprise to see Qoros saying that its cars will be designed to receive maximum ratings in Euro NCAP crash safety tests. Qoros is actually part of Chery Automobile and was established in 2007 but the brand says it is starting from scratch with a clean of sheet of paper. Unlike the majority of Chinese brands, it says its cars will major on design. The proof, as they say, will be in the pudding so we will have to wait until next year to see whether Qoros cars are any good. I find this rather worrying for the makers that actually manufacture in the UK and Europe where the overheads and labour costs are considerably higher. I see also that Russia intends to introduce a low-price Lada Granta shortly. Another market to watch is Hungary where the automotive industry is the mainstay for Hungarian manufacturing. Several of the large manufacturers are already there such as Opel and Audi, however I see with interest that The Schaeffler Group who have been there since 1994 are, over the next year or so, expanding their operation which will increase their workforce by around 700. With German know-how, cheap labour costs and overheads, plus companies like Schaeffler increasing investment - how long before Hungary introduces a competitive brand also.